Prisons in America are places of severe hardship, trauma, and pain. Perpetuating a legacy of slavery and racial oppression. Decimating families and communities—making us less safe. It's time to imagine something new. This report—unlike anything we have ever produced at the Vera Institute of Justice (Vera)—is about the possibility of radical change. It asserts a dramatic reconsideration of the most severe criminal sanction we have: incarceration. It articulates a view that is sure to be alien to many. Yet we need not accept as a given the way we do things now and we encourage you to envision a different path. Indeed, our vision has concrete reference points. It is in the hope, daring, and promise of a small unit for young adults in a Connecticut maximum-security facility. It is inspired by what we learned studying and visiting prisons in Germany, where the very conditions and operations of that entire system are defined by a commitment to uphold human dignity—a commitment born of that country’s coming to terms with the Holocaust. And it is rooted in our own obligation—now physically exhibited in a museum and memorial in Montgomery, Alabama—to acknowledge and atone for our brutal history of dehumanization and racial oppression and to understand how it has shaped what we do today in our justice system. Our mission is to link these things, and suggest a path forward that is as much about reconciliation as it is about criminal justice reform. More than a decade ago, Vera’s own Commission on Safety and Abuse in America’s Prisons tried to bring life behind bars fully into focus. We detailed the punishing and often inhumane conditions of confinement suffered by the hundreds of thousands of men and women who are held in our nation’s prisons. We did so because we believed the country was malignly ignorant of what was going on behind those grey walls. While we painted a picture of these harms, we did not sufficiently examine the deep roots that our current practices have in this country’s history of legalized slavery and racial oppression. We do so here. In June 2016, we launched this initiative, Reimagining Prison. We sought to explore how America could do things differently—how we could fundamentally alter the way we view people who make mistakes and come into contact with the justice system; and how we could fundamentally alter our conception of the obligations we have to them as fellow human beings in this shared enterprise of democracy. This report presents a vision of what could come to pass should we decide as a country that incarceration will no longer be used as a tool of racial oppression. It presents a vision of what could come to pass should we decide as a country that those whom society fears—those for whom incarceration is the last and only tool we can muster to redress the harms they may have done—are not banished as members of our human family, and forever retain the inalienable right of human dignity. This vision of prison was not accidental and would hold sway for generations. It manifested itself in such practices as convict leasing, a brutal and financially lucrative system in the Reconstruction South that created incentives for governments to arrest and convict newly-freed black people in order to sell their labor to private industry; and chain gangs, in which incarcerated people, primarily black men, were shackled together, publicly humiliated, and forced to perform public works such as building roads or clearing land. Although such practices largely came to an end by the middle of the 20th century, the “slave of the state” vision of prison persists. ...the “slave of the state” vision of prison persists. Over the last 50 years, inhumane working and living conditions and the daily degradations of prison life have been the stated reasons behind continuing prison unrest and protest. In 2013, some 30,000 people in various California correctional facilities refused food—some for close to two months—in protest of the state's use of long-term solitary confinement. And, in April 2018, the dismal reality of life in prison—two meals of “barely nutritional,” sometimes moldy, food; “putrid water;” metal plates placed over windows; sweltering and filthy rooms; and no-hope idleness—simmered into explosive acts of violence at a prison in South Carolina that left seven dead and 17 injured, sparking a nationwide prison strike in protest of conditions described as modern day slavery. Prison in America continues to be a place of severe hardship for those held there—a degree of hardship that is largely inconceivable to people who have not seen or experienced it themselves or through a loved one. It is an institution that causes individual, community, and generational pain and deprivation. For those behind the walls, prison is characterized by social and physical isolation, including severe restriction of personal movement. Prison enforces idleness and denies access to productive activities. It provides insufficient basic care, such as adequate food and medical services, and prevents incarcerated people from securing those services for themselves. Incarceration results in a loss of meaningful personal contact and the deterioration of family relationships. Prison strips people of constitutional rights and avenues to justice. Those who work in prison are not exempt. Corrections officers suffer from post-traumatic stress disorder and commit suicide at significantly elevated rates.Simone Weichselbaum, “For Corrections Officers and Cops, a New Emphasis on Mental Health,” The Marshall Project, June 14, 2017, https://perma.cc/UKR7-5VXG. In prison, everyone is serving a sentence. In prison, everyone is serving a sentence. Beyond the walls of prison, incarceration’s impact is broad: mass imprisonment disrupts social networks, distorts social norms, and hollows out citizenship.Dorothy E. Roberts, “The Social and Moral Cost of Mass Incarceration in African American Communities,” Stanford Law Review 56, no. 5 (2004), 1271-1305, 1281-97, https://perma.cc/333B-U6EA. The high rate of incarceration—most notably among black Americans—as well as the individual impact of incarceration, has decimated the communities from which people in prison come.Todd R. Clear, Imprisoning Communities: How Mass Incarceration Makes Disadvantaged Neighborhoods Worse (New York: Oxford University Press, 2009). Its impact is also intergenerational—the children of incarcerated parents are more likely to experience psychological trauma, difficulties in school, and financial challenges.More than five million children in the United States have had a parent in state or federal prison at some point in their lives. One in nine black children had a parent behind bars in 2008. See Teresa Wiltz, “Having a Parent Behind Bars Costs Children, States,” Pew Charitable Trusts, May 24, 2016, https://perma.cc/UH9C-GUEA. This hardship has become so common and is so stigmatized that the long-running children’s television program Sesame Street produced materials for caregivers about how to speak with children about their incarcerated parent. Sesame Workshop, “Sesame Street Launches New Resources for Young Children with an Incarcerated Parent,” press release (New York: Sesame Workshop, June 12, 2013), https://perma.cc/6TNG-AGD2. This hardship has become so common and is so stigmatized that the long-running children’s television program Sesame Street produced materials for caregivers about how to speak with children about their incarcerated parent. The result is a pervasive and pernicious denigration of the humanity of those who live and work inside American prisons that ripples out to communities and across generations. “The cell was so small that I could stand in one place and touch both walls simultaneously....As they built new walls around me it felt like I was being buried alive...."Thomas Silverstein, describing his experience in solitary confinement to Jean Casella and James Ridgeway, in “Five Unforgettable Stories From Inside Solitary Confinement,” Solitary Watch (2017)[footnote]Jean Casella and James Ridgeway, “Five Unforgettable Stories From Inside Solitary Confinement,” Solitary Watch, November 27, 2017 (quoting Thomas Silverstein describing his experience in solitary confinement), https://perma.cc/Y8R3-KCSQ. Tens of thousands of people in U.S. prisons are now held in solitary confinement either as punishment for rule-breaking or, for a small number, as a preventive safety measure. People held in solitary confinement live in a six-by-eight foot cell, smaller than a standard parking space, for 22 to 24 hours per day. Long-term isolation has been shown to create or exacerbate mental illness and physical health problems from which prisoners often never recover. Research also suggests that restrictive housing units actually create or escalate behavioral issues and violence among incarcerated people, rather than contain or reduce them. Another reality of the prison experience is loneliness. During the prison boom of the 1990s, many new prisons were constructed in poor, rural areas. Siting prisons in rural areas—especially when coupled with restrictive visitation and furlough policies—has made it all the more difficult for people in prison to sustain personal relationships with their families and friends. With prisons farther from population centers, many more people are forced to serve their sentences in places that may be unreachable by public transit—and where visiting can place a substantial cost burden on friends and family, who may have to miss work, pay for childcare, and cover the costs of travel, including a place to stay, food, and gas. Receiving fewer visits from family and friends not only exacerbates the isolating experience of prison, but it also implicates community safety, as regular visitation is associated with a reduction in future criminal justice contact after prison. ...regular visitation is associated with a reduction in future criminal justice contact after prison. Who ends up in America’s prisons is the result of decisions made by numerous actors in the criminal justice system. By the turn of the 21st century, longer sentences, combined with more aggressive policing strategies for quality-of-life and low-level drug crimes in many urban centers, resulted mostly in more people going to prison—and staying there for longer periods of time.For an in-depth discussion of the growth of incarceration, its impact in increasing racial disparities in imprisonment rates, and the policies and practices that contributed to this growth, see Travis, Western, and Redburn, The Growth of Incarceration (2014), at 33-103. These people are disproportionately Americans of color. This is most visible in the number of black Americans behind bars, although other groups—such as Latino and Native American people—are also overrepresented in prison in comparison with their presence in the general population.In 2015, there were 1,745 black people, and 820 Hispanic people, in state and federal prisons per 100,000 U.S. residents, compared to 312 white people. E. Ann Carson and Elizabeth Anderson, Prisoners in 2015 (Washington, DC: BJS, 2016), 8, https://perma.cc/273U-4PPN. Native American people are admitted to prison more than four times as often as white people. Christopher Hartney and Linh Vuong, Created Equal: Racial and Ethnic Disparities in the US Criminal Justice System (Oakland, CA: National Council on Crime and Delinquency, 2009), https://perma.cc/7HWH-BXYA. Today, black men and women make up just 13 percent of the country’s population, but they represent more than 35 percent of those incarcerated in American prisons—making black Americans the largest racial or ethnic group in state or federal prisons.State and federal prisons incarcerate 523,000 black (35.4 percent), 499,400 white (33.8 percent), and 319,400 Hispanic people (21.6 percent). The Bureau of Justice Statistics does not report regular figures on incarcerated members of other races or ethnicities. See Carson and Anderson, Prisoners in 2015 (2016), at 6. White people who do not identify as Hispanic or Latino make up 61.3 percent of the U.S. population; Hispanic/Latino people make up 17.8 percent, and black or African American people make up 13.3 percent. See U.S. Census Bureau, “U.S. Census QuickFacts,” https://www.census.gov/quickfacts/fact/table/US#viewtop. The year 1865 should be as notable to criminologists as is the year 1970. While it marked the end of the Civil War and the passage of the 13th Amendment, it also triggered the nation’s first prison boom when the number of black Americans arrested and incarcerated surged.Christopher R. Adamson, “Punishment After Slavery: Southern State Penal Systems, 1865-1890,” Social Problems 30, no. 5 (1983), 555-69; Khalil Gibran Muhammad, “Where Did All the White Criminals Go? Reconfiguring Race and Crime on the Road to Mass Incarceration,” Souls 13, no. 1 (2011), 72-90; and Western, “The Prison Boom” (2007), at 30-36. This was the result of state governments reacting to two powerful social forces: first, public anxiety and fear about crime stemming from newly-freed black Americans; and second, economic depression resulting from the war and the loss of a free supply of labor. State and local leaders in the South used the criminal justice system to both pacify the public’s fear and bolster the depressed economy. All across the South, “Black Codes” were passed that outlawed behaviors common to black people, such as “walking without a purpose” or “walking at night,” hunting on Sundays, or settling on public or private land.These laws also stripped formerly incarcerated people of their citizenship rights long after their sentences were completed. Among the most well-known examples are laws that temporarily or permanently suspended the right to vote of people convicted of felonies. Adamson, “Punishment After Slavery” (1983), at 558-59; A. E. Raza, “Legacies of the Racialization of Incarceration: From Convict-Lease to the Prison Industrial Complex,” Journal of the Institute of Justice and International Studies 11 (2011), 159-70, 162-65; Christopher Uggen, Jeff Manza, and Melissa Thompson, “Citizenship, Democracy, and the Civic Reintegration of Criminal Offenders,” ANNALS of the American Academy of Political and Social Sciences 605, no. 1 (2006), 281-310; and Elizabeth Hull, The Disenfranchisement of Ex-Felons (Philadelphia, PA: Temple University Press, 2006), 17-22. Southern law enforcement authorities targeted black people and aggressively enforced these laws, and funneled greater numbers of them into the state punishment systems. By the 1870s, 95% of people under criminal custody of the Southern states were black. The first half of the 20th century saw an expansion of prison populations in the Northern states, which coincided with shifting ideas about race and ethnicity, an influx of black Americans to urban regions in the North, and increased competition over limited jobs in Northern cities between newly-arrived black Americans and European immigrants. As a backdrop to these changing demographics, public anxiety about crime flourished. Beginning in the 1960s, a “law and order” rhetoric with racial undertones emerged in politics, which ultimately ushered in the era of mass incarceration. As in previous periods, the criminal justice system was used to marginalize and penalize people of color. From 1960 to 1990 the racial composition of people in prison in the United States flipped from 70% white to 70% black. 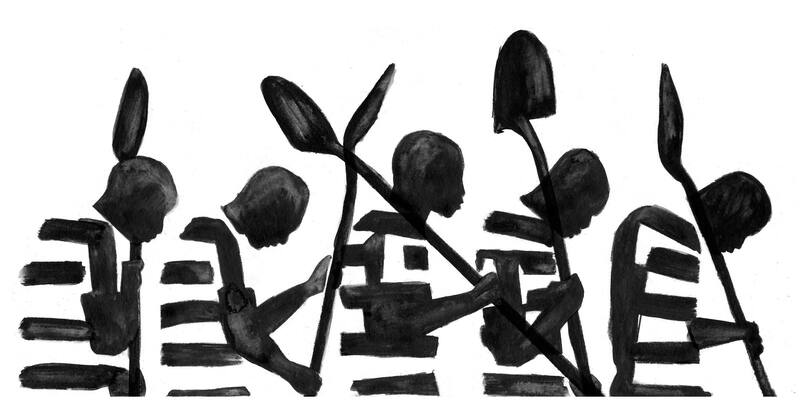 We as a nation have not yet fully grappled with the ways in which prisons are intimately entwined with the legacy of slavery and generations of racial and social injustice. It is time to acknowledge that this country has long used state punishment generally—and incarceration specifically—to subordinate racial and ethnic minorities. The day in which these hard and shameful truths can be spoken—and must be examined—is here. With the opening in Montgomery, Alabama, of the Legacy Museum: From Enslavement to Mass Incarceration, and the National Memorial to Peace and Justice, which memorializes the lives of those lynched in our nation’s campaign of racial terror, Americans are being newly asked to reckon with the truth about our nation’s past and to sow seeds of hope for the future. Our reckoning must include a deep consideration of the purpose and use of incarceration in this country. And so, to take a truly decisive step away from the past, America needs a new set of values to ground prison policy and practice—values that recognize, interrogate, and unravel the persistent connections between racism and this country’s systems of punishment. Vera proposes that human dignity be the foundational, organizing principle of the nation’s corrections system. A prison system grounded in human dignity directly responds to the faults created by centuries of racial oppression. This principle dictates that “[e]very human being possesses an intrinsic worth, merely by being human.”Christopher McCrudden, “Human Dignity and Judicial Interpretation of Human Rights,” European Journal of International Law 19, no. 4 (2008), 655-724, 679, https://perma.cc/8D5H-BCZ5. It includes the recognition of a person’s capacity for self-respect, self-control, empowerment, autonomy, and rationality.McCrudden, “Human Dignity” (2008), at 701. It is inviolable—and remains intact even when one breaks rules or engages in criminal behavior while in prison. It applies to people living in prison as well as the corrections staff who work there. Out of this emerges a system dedicated to fairness, equity, and respect. Human dignity relies on an entirely different set of assumptions about incarcerated people than those that not only instigated and sustained the past four decades of tough-on-crime policies, but also America’s historic use of prison as an institution of racist social control. Where we have denied humanity, we must embrace human dignity. Movements that seek to reveal, make amends for, and respond to historical social injustice mark the global landscape. See what we learned from touring German prisons. Our vision of a system committed to human dignity is indeed a generational, audacious goal. We do not believe it can be achieved over the course of a few years. We must end mass incarceration. We must end the practice of locating prisons in the remote rural periphery for economic gain. And we must end the practices that lead to disproportionate impact of incarceration on people of color. Despite the challenges of this aspirational goal, movement toward human dignity in America’s prisons is possible today. Inspired by how the German prison system treats young adults aged 18 to 25, and visits to Northern European corrections systems, the Connecticut Department of Corrections (CT DOC) established the T.R.U.E. program in early 2017 with assistance from Vera. The program’s name, developed by residents of the unit, is an acronym for Truthfulness (to oneself and others), Respectfulness (toward the community), Understanding (ourselves and what brought us here), and Elevating (into success). T.R.U.E. is a therapeutic unit for young men that focuses on developing their sense of self, autonomy, and responsibility, and keeps a clear focus on preparing for life after prison. The T.R.U.E. unit exemplifies many of the practice principles set out in this report, and it serves to demonstrate not only that a corrections system can prioritize human dignity as a central value, but also that such a practice can lead to transformational results. Mentorship is key to the unit’s model. A group of older men who are serving life sentences act as mentors to the young men. The mentors live in the unit among their mentees, and work together with the staff to develop and lead therapeutic programs. They also work with staff and mentees to establish and enforce agreed-upon rules and multiple systems of accountability. Together, the staff, mentors, and mentees have created an atmosphere of kindness, compassion, and trust—one that recognizes the intrinsic worth of each person who lives or works within its walls. ...staff, mentors, and mentees have created an atmosphere of kindness, compassion, and trust. The T.R.U.E. experience highlights that reimagining prison in America need not wait until total prison population declines or more prisons are built closer to where the incarcerated population lives. Reimagining prison is possible now. Through this report, we provide an aspirational vision and a blueprint for concrete reforms—which systems can consider, debate, and experiment with today, with the hope that by laying the necessary foundation of human dignity something new and wholly different will come tomorrow. The Vera Institute of Justice would like to thank all the people who so generously contributed their time, talent, insights, and art in bringing the Reimagining Prison Webumentary to life, and for revealing the injustice and inhumanity of America's prison system. The world would be a darker place without your light.